During April & May, we gathered hundreds of signatures on a petition backing the AFT’s Workload Equity proposal. In the first weeks of the fall semester, more faculty members have signed, and more are signing as I write this article! If you haven’t yet signed the petition or want to find out more about the Workload Equity proposal, go to AFT1493.org. Your AFT Chapter Chairs and Executive Committee Reps on your campus are eager to talk to you about it. Michelle Kern and I, in our positions as Strategic Campaign Initiative (SCI) Organizers, would love to have a conversation with you about this and any other issues, questions or concerns that are bubbling in your mind. Do not hesitate to flag us down when you see us, or email us at: harer@aft1493.org & kern@aft1493.org . Our job is to listen to you, bring you informational materials (plus apples and chocolates!) and help you in any way we can. As you may know, the real estate crunch is affecting rental prices in San Mateo County. Many faculty already live outside of the District due to the cost of apartments and houses, and families that live and work in the County are seeing draconian rental hikes and even facing mass evictions. Michelle was involved last spring working with the 4 North County coalition, where the housing crisis was identified as a key issue facing working people, education, and community equity. This summer, these 4NC and other coalitions such as Burlingame Advocates for Rental Protection, San Mateo County Anti-Displacement Coalition, Urban Habitat, and Faith in Action gathered enough signatures to put measures for tenant protections on the ballot for the November 8th election. Yes on R in Burlingame and Yes on Q in San Mateo will help renters gain some control in a market that is now without any limits on how high a landlord can raise rents or show cause for eviction. 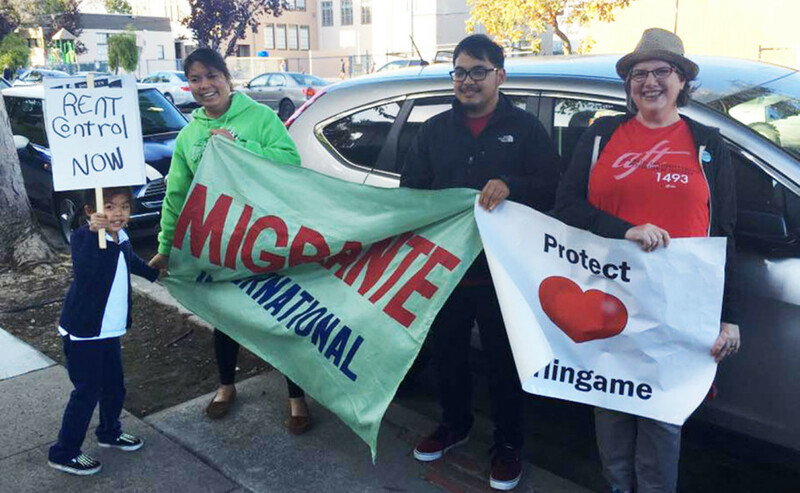 This month Michelle and other members of 4NC, along with other members of the coalitions, attended a rally for eight families in Burlingame who were all served with eviction notices, to empty the building. The tenants who spoke were all working mothers who highlighted that this eviction came right as their children were beginning the school year, and the women all spoke of the chance for greater educational opportunity in San Mateo County for their children as the reason they were fighting so hard to stay. Our present and future students are being displaced, and our union will be working to support the tenant protection measures in the election. AFT Local 1493 has endorsed the rent stabilization and just cause eviction measures in Burlingame (Measure R) and San Mateo (Measure Q) that will be on the November ballot. All Out For Prop 55! Proposition 55 is on the November ballot and we hope all of you will help us tell faculty and staff colleagues to vote YES on Prop 55 to ensure a stream of funding for California public schools and community colleges. (See article on page 3 for details about Prop 55.) Look for Prop 55 tables on your campus and flyers in division workrooms. Your union will be taking part in phone banking “parties” at the San Mateo Labor Council on these dates: Tuesday October 18 and Tuesday November 1st from 6:30-8:00 with a free dinner and lots of camaraderie guaranteed. Call the AFT office (x6491) to let us know you’d like to join us. Even if you can just stay an hour – we want you with us! Workers from other unions are phone banking for public schools, and it’s only right that we be there with them getting out the vote. Spread the word to colleagues, students and friends to support public education in California by voting for Prop 55. Katharine and Michelle are continuing to visit new and new-ish faculty, with Michelle focusing on part-timers and Katharine on full-timers. We come bearing gifts! We bring a tote bag stuffed with goodies – your free bright red AFT t-shirt, a members’ packet of valuable information and other useful materials and gifts. If you haven’t seen or heard from one of us yet, just contact us and we will arrange a visit.